Business Goal Setting: Eight Steps to Put You on Track for Your Most Successful Year Ever! It’s a new year – which means a fresh start for your business and your goals. One of the highest pay-off tasks you can do right now is make sure you have thoroughly completed business goal setting. Here are eight resolutions that will help your business goal setting exercise lead to your most successful year ever. 1. Resolve to: Set your business calendar for the year. Starting the year by lining out your key tasks makes it clear what you need to tackle and when. Include new product launches, public relations outreach activities, marketing plans, networking events and trade shows. When you see each of your focus activities lined out on the calendar, you can see where you need to devote time and resources so you have amply spread them throughout the year. 2. Resolve to: Commit to planning time. It’s easy to focus on the items in No. 1 that have dates attached – whether it’s the launch of your spring line or a monthly networking group. But also make sure to include time each week to reflect and analyze to see what’s working in your business. You want to be flexible and savvy enough to jump on a trend or any new potential opportunity for your business. By sitting down each Monday morning or Friday afternoon, for example, and devoting some time to checking and shifting priorities, you can make sure that you are making those little tweaks that set your business up for success. 3. Resolve to: Consider hiring outside help. I see many small businesses who feel that they have to “do it all,” even when undertaking activities that are not core to the business. Could your business use a bookkeeper, a marketer, or even someone to help packet and ship product? Instead of viewing outsourcing these roles as a cost center, consider them an investment in your business. They allow your business to run smoother, and they free up time for you to spend on what matters most – growing your business. Profit clarity means that you determine what aspects of your business are most profitable and make every attempt to maximize them. This means avoiding wasting time on unprofitable ventures or activities and making sure that you have designed the right business model to reach your highest potential. Be ruthless about examining bills as they come and out. Is every expenditure directly related to your core business? Are you using your time and talents at the best and highest use? 5. Resolve to: Re-examine your customer and their needs as they change from year to year as your business grows. The key as an entrepreneur is to leave room to take advantages of opportunity, but also to allow yourself to let go of something if it isn’t working — to set aside your personal emotional investment. The best way to know what’s working best is to listen to your customers and their feedback. What are they struggling with? Find out these challenges, and then create a clear solution to their problem. For example, take a jewelry designer who takes the time to consider her client base. Is a large proportion of your clientele older? Maybe they would benefit from a magnetic clasp because they find it hard to fasten a necklace with a lobster clasp. Or, are your customers a lot of younger moms with young children? They would appreciate you offering earrings that don’t dangle so they won’t get caught by their children’s tiny fingers. 6. Resolve to: Get comfortable with the uncomfortable. Every small business owner has to come to grips with the fact that there will be facets of your business that you prefer more than others. Take that same jewelry designer. Maybe she adores the act of developing and creating designs, but shies away from trunk shows where she has to interact with customers. At the same time, she knows that having that personal touch and word-of-mouth interaction will benefit her business in the long run. Or, you realize that there will be times in your business that are busier, and times that will be slower. Allow for that and plan for that – and take advantage of it! If you know that your busy time is spring, refer back to that calendar we talked about in Point No. 1 and frontload your winter with production and marketing tasks, so that you can focus on fulfillment in the spring when you need it. Or, maybe back-to-school is your busy time. Can you extend the busy time by offering a special at the end of school? Remind your customers that they can save money and be a step ahead by purchasing a school-related item at the end of the year. Sometimes entrepreneurs need to let go. As an example, I know a very successful Italian restaurateur who said at the beginning of her business she would never, ever allow a BBQ chicken pizza to cross the threshold of her brick oven. To her, BBQ chicken pizza was anything but Italian – and an affront to her authenticity! But after listening to her customers – again, that key commitment every business owner must do continually — she relented. And guess what? It has been her No. 2 seller for years. 8. Resolve to: Meet regularly with other professionals. This last resolution will help you reach all your other ones, I guarantee. One of the best choices you can make is to set aside time to form or join a Mastermind group. This is a group of individuals who come together at regular intervals to support and counsel one another in an organized setting – whether in person or virtually. The benefits are huge because the whole goal of this group is to meet with other professionals to set goals, which you are accountable to achieve prior to the next meeting. And that’s the key to successful business goal setting: knowing that it’s not a one-time process, but rather an ongoing need to find clarity in your activities. 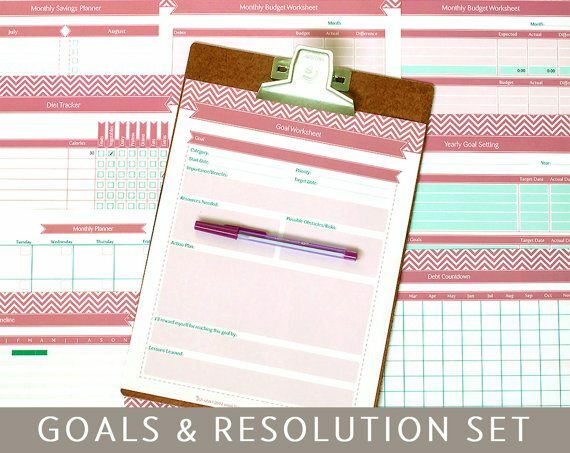 Sitting down while the year is fresh and making resolutions to set and revisit goals throughout the year is the perfect way to start the business year off right! What business goals will you be setting this year? Tell us in the comments! You may also want to check out http://www.GoalsOnTrack.com, a nice web app specifically designed for tracking goals and todo list, and time tracking. It’s clear, focused, easy to navigate. Looks like a great goal setting app, Harry. I will definitely check it out! Thanks for the tip! New product launch and craft fairs outside of the areas I normal do. It’s a great idea to move outside of your specific local region. And getting direct feedback from customers at live events is so important. Thanks, Shalene! Thank you for the practical tips and tools Laura.